After returning home from a few days in Ireland I’ve started to feel super Summery. With that in mind I thought I’d pick out a few pieces from the Topshop website and here they are. I’m absolutely loving the look of shirt dresses and this one is no exception, so simple but girly. A pair of denim shorts is essential in my opinion and I’ve got the perfect outfit in mind for these shorts. I love bags and I love this saddle bag, I’d usually opt for a brown bag for summer but I feel black is slightly more versatile. A pair of white hi top converse have been on my ‘To Buy’ list FOREVER but I’ve never got round to buying any. I had a pair of burgundy hi top converse when I was 15 and they lasted SO WELL. A final essential in my opinion is a playsuit, super easy to throw on and look well put together and they can be dressed up or down and worn right through to Autumn. 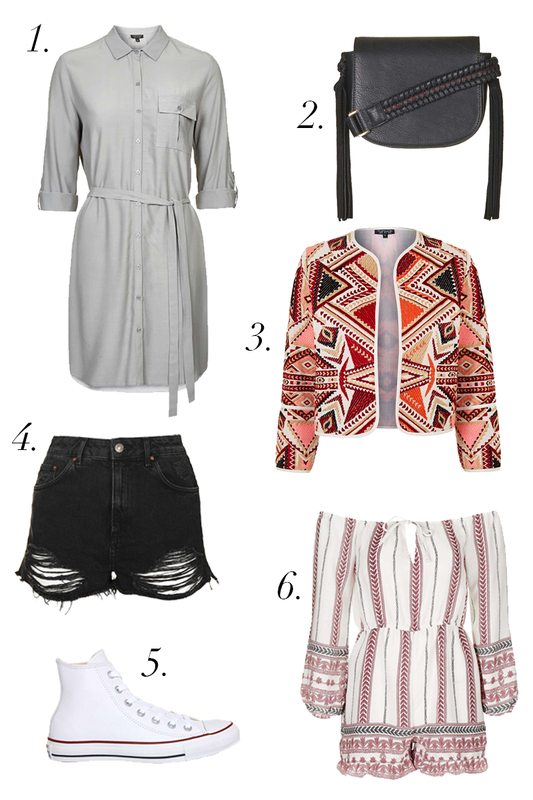 So there are my summer Topshop picks, I hope you liked this post and hopefully I’ll see you soon.